These toddlers get in a heated debate on whether it’s raining or sprinkling outside. You can’t blame them since their mommies to told them two different words for the same thing. The third little girl tries to play mediator and keep every one calm. Things escalate when the poking starts and so does the cuteness! 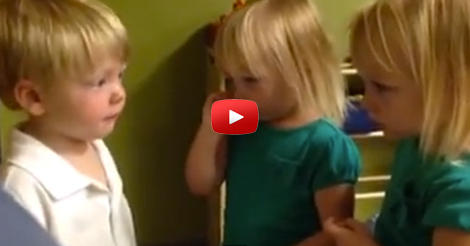 The little girl insisting that it’s raining outside pokes the little boy and his reaction couldn’t be more adorable! I’m not sure how the daycare provider didn’t burst out laughing as she watched these kids hash out who was right. I love how little kids work stuff out. They get so serious. Children debating the weather rain vs. sprinkling and it touches his tender heart! This kid is going to grow up to be a real sweat heart. What do you think? Are they all still daycare friends? COMMENT with a story of kids being cute!